MISSION: The SongsWithMyName Reseller Program exists to offer entrepreneurs and others a highly profitable opportunity to bring more joy into the world through the selling of personalized products to families and children. Join us in bringing more joy into the world by selling these personalized products full or part-time TODAY! You will be able to sell our products for up to 2 – 3 times your wholesale cost! Sell physical or digital download products! Choose from retail-ready to dropship to full-serve reseller programs! * Sell Products People Already Know and Love! No need to explain! 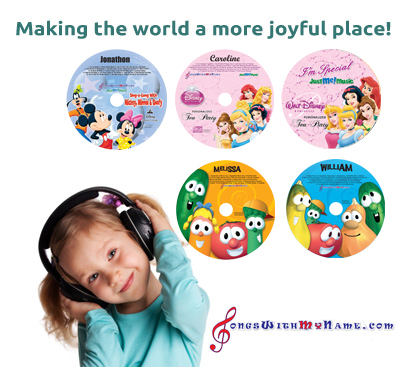 Simply let customers hear their child’s name sung and spoken by their favorite characters. Every sale changes lives by bringing joy into homes across the world. * Sell at Your Own Pace in Sales Channels You Know! Choose what works best for you! Online, in your store, at shows and fairs, through mall kiosks, fundraisers, parent groups, alongside your other products and more. * No Excess Inventory. Everything is on request! Our products require minimal inventory…and you sell them quickly and efficiently as you need them! In fact…our minimums are as low as 10 units! Sell the Best… Don’t Settle for Less! The Songs With My Name Reseller Program is sold and serviced by SongsWithMyName Services Ltd.